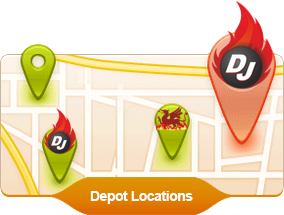 This website www.djdaviesfuels.co.uk (the "Site") is operated by DJ Davies Fuels Limited of Blaenau Fuel Depot, Blaenau, Ammanford, Carmarthenshire, SA18 3BZ also referred to in this Cookies Statement as "we" or "us" or “our”. We are committed to protecting and respecting your privacy. This Cookies Statement should be read together with our Privacy Statement and explains what cookies are and how and why they may be stored on and access from your device when you access this Site. Cookies are text files containing a small amount of data, usually a unique string of letters and numbers. They commonly used throughout the Internet and are stored on and accessed from your device when you visit a website (including this Site). This allows the website to recognise your visit from those of other users of the website. You can find more information at www.allaboutcookies.org and www.youronlinechoices.eu. These cookies are used to collect information about how visitors use our site. The cookies collect information in an anonymous form, including the number of visitors to the site, where visitors have come to the site from and the pages they visited. We use the information to compile statistic reports of our users’ browsing patterns so that we can improve the Site. For more information please visit support.google.com/analytics/answer/6004245. This cookie is used to identify a user's browser as they go from page to page on the website. It is a session cookie, which means the cookie is deleted when you leave the Site. It is an integral part of the website software and is used to let the server know which users are on the Site at any given time and make certain parts of the Site easier to use (for example, to store page preferences such as colour scheme chosen for the duration of your visit, when you register for one of our events online or apply online for one of our trainee or placement positions). For more information please visit www.allaboutcookies.org/cookies/cookies-the-same.html. When you enter the Site, we may also collect information, where available, about your computer for system administration purposes, such as your IP address, operating system and browser type. This information may be combined with the data we collected via the Google Analytics cookies above. This information is statistical data about our users’ browsing patterns and generally does not identify our users.